For that US Ambassador at a European post who had the US embassy celebrate the 4th of July in April, and not for the first time because it gets, what? Oh .... hot in his/her host country ... we're told. And for that US Ambassador at an African post who had the US mission celebrate the 4th of July in February (nobody knew why February); we're told nobody was bold enough to ask why 4th of July in February did not include the singing of the U.S. national anthem. Is this kind of like Christmas in July advertised foolishly on teevee ---but no caroling? I don't know. Here is what you do for the 4th of July celebration: I think you're supposed to celebrate it in July! We can understand if it is a day or a few days off if there is a hurricane, or a sandstorm, or security concerns but -- months or weeks ahead, c'mon, what's with that? R&R? Home Leave, what? Yup, I know it gets hot in your host countries, but oh dear, -- I think it gets hot in a bunch of other countries, too. Including Afghanistan, which is hotter than most -- in more ways than one. See? 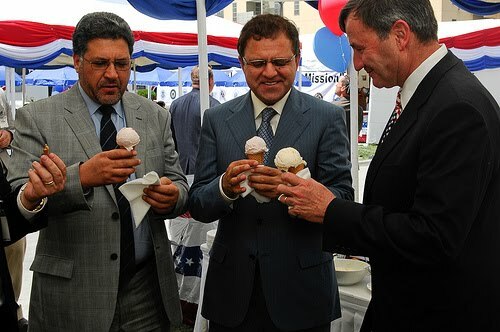 It looks like Ambassador Eikenberry and his guests are enjoying their ice cream in the snapshot below. Here is definite proof that you can have your ice cream and eat it too, and not melt in hundred degrees heat. Former US Ambassador Prudence Bushnell writes about.Planet WDC..
State Dept's Digital Diplomacy - Clip & Show ..
Stranger things have happened in the Mediterranean.island..